California and Oklahoma are about as different as two states can be, but in recent times they have both experienced the unintended consequences of underground fossil fuel industry activities, and they share some key similarities. In both cases -- the California methane leak and the Oklahoma earthquake swarms -- the main factors are a lack of knowledge, preparation, and safety planning for fossil fuel operations located in or near populated areas. The nation's oil and gas infrastructure is aging, even as the industry has expanded its territory with the rise of fracking technology and constructed (or sought permits for) new pipelines and storage facilities. So, now would be a good time to bump up safety and monitoring requirements. However, as demonstrated by both California and Oklahoma, getting the industry to respond is more complicated than it may seem. For those of you new to the topic, last fall one of the nation's largest underground natural gas storage facilities began leaking. The SoCal Gas facility is located near the comfortable community of Porter Ranch, California, and 30 miles from downtown Los Angeles. Since then, schools have closed and thousands of residents have fled their homes with a variety of health problems. The consensus is that the main culprit is not the gas itself, but an added chemical that provides the otherwise odorless gas with its distinctive smell. Somewhat ironically, the odorant is a safety precaution that enables anyone with a functioning sense of smell to detect even a very small gas leak, without the need for any special training or equipment.
" ... Current monitoring is not using sensitive enough testing techniques and this makes it difficult to understand what types of exposures are occurring. Some of the current testing is only able to detect levels of the tert-butyl mercaptan 50 times higher than the level where you expect to have health impacts from odors. We need more information that is able to narrow this gap." In this day and age, with generations of experience under its belt, the fossil industry should be well prepared to assess and respond to the impacts of its operations in populated regions. Clearly it is not. A similar situation is at hand in Oklahoma. Thankfully the earthquake swarms besetting the state have resulted in few injuries, but in recent years this once-quiet region has now cemented its reputation as the most earthquake-prone region in the entire world. The U.S. Geological Survey pinned some of the blame for an increase in earthquakes in the U.S. in general, and Oklahoma in particular, on the practice of injecting massive quantities of wastewater from oil and gas drilling operations underground. 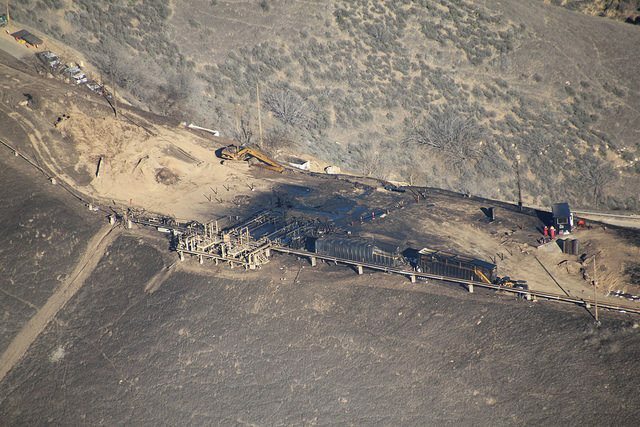 As with the California methane leak, firmly establishing cause and effect has been a difficult task due to relaxed reporting requirements, lack of data, and the lack of adequate staff to investigate a meaningful fraction of the incidents. However, evidence has been accumulating that links injection wells (and, in rare cases, fracking itself) with earthquakes in populated areas, once again calling into question whether the oil and gas industry -- a mature industry with generations of experience and research under its belt -- is sufficiently prepared to safely expand its operations. To its credit, the Oklahoma Corporation Commission (OCC), which exercises the state's authority over oil and gas operations, seems to have adopted the U.S. Geological Survey's approach to assessing earthquake risk hazards. Rather than sitting back and waiting for more evidence, the agency has called for more pressure testing of injection wells, and in some cases a temporary suspension of operations. Also to its credit, the fracking waste disposal industry has cooperated with the commission's requests -- with one notable exception. "We look forward to addressing this issue through OCC's established rules and procedures, which will ensure decisions are based on scientific analysis." The Wall Street Journal has more detail indicating that the company's small size and failure to diversify its operations have boxed it into a position where it simply can't afford to take steps to address a clear threat to public safety. In any case, it would seem that a scientific risk analysis is the kind of thing that should have been done beforehand. Speaking of risk analysis, just last week fellow TriplePundit author Jan Lee pointed out a connection between the California methane leak and the dire situation in Flint, Michigan, where a series of horrifyingly irresponsible decisions about the city's water supply has apparently resulted in a massive -- and entirely avoidable -- case of lead poisoning. Cementing Lee's point, on practically the same day that California's governor declared a state of emergency over the methane leak, Michigan Gov. Rick "Re-Inventing Michigan" Snyder declared a state of emergency for Flint and the surrounding Genesee County. Meanwhile, Oklahoma Gov. Mary Fallin is meeting with seismologists, and she has been increasingly supportive of the OCC's efforts to mitigate earthquake risks in her state. The next step for OCC is legal action against Sand-Ridge, so hopefully Gov. Fallin will not be forced to add a third state of emergency to the list. Image credits: 1) Flickr/Earthworks 2) (screenshot): via U.S. Geological Survey.